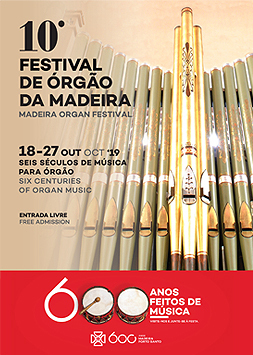 The 9th Madeira Organ Festival – which will take place between 19 and 28 October, with eleven concerts in ten churches and convents, involving four districts – is based, once more, on a diverse programme which, having as its main objective the dissemination of the organ heritage extant in the Region of Madeira, is also one of its principal cultural-touristic attractions, being considered, moreover, as one of the best organ festivals in the Iberian Peninsula. A festival which simultaneously promotes the religious architectural heritage in which these instruments are to be found, and which foments, for both residents and visitors, interest in a different musical genre. By including the commemorations of the 600th anniversary of the discovery of these islands, this Festival is also, in its ninth edition, enriches its content, renews its thematic range and, for the first time, also takes place in Porto Santo, with the theme “Six centuries of organ music”. There is also, and for the first time, an educational element in the form of master-classes and interaction with the community which will naturally bring the festival ever close to its audiences. The inclusion of the 600th anniversary and the fact that we have programmed concerts dedicated to each century gives, indeed, a greater wealth and diversity to this cultural event which, it is hoped, will find its response in the already faithful audiences of this initiative, but also in new audiences – whether tourists or residents – who wish, during this week, to enjoy a different cultural experience in this place. Bearing in mind the history of this initiative and the every-increasing interest which has been shown, in previous editions of the festival, we believe that these elements newly introduced this year will benefit it even more as an integral part of the high-quality cultural programming which characterizes the Region, and also as a demonstration of the excellence which has conquered our visitors and which should, for that very reason, be seen as a singular event both nationally and in the European context. This being a project which arises from a number of synergies, I wish to thank most sincerely the collaboration which has been continued with the Diocese of Funchal and the total availability of the churches involved, as I also acknowledge the dedication and professionalism of Professor João Vaz, artistic director of the Madeira Organ Festival, who has contributed greatly not only to the development of this event, but also to promoting knowledge and greater appreciation of the organ heritage of the region. Associating itself with the celebration of the six hundredth anniversary of the discovery of the islands of Madeira and Porto Santo, the Madeira Organ Festival presents in 2018 a programme which evokes the trajectory of the history of music during the course of those six centuries. During the period when the Portuguese navigators saw the archipelago of Madeira for the first time, the organ – which had been introduced into the Catholic Church from the 13th century – began to become established as an instrument with its own repertoire. Indeed, the first written sources date from the 15th century, as is the case with the Buxheimer Orgelbuch and the Amerbach Tablatur. Since then, the composition of music for organ has been a constant throughout the history of music, adapting itself – as has the morphology of the instruments themselves – to the musical tendencies of each period. The content of this edition of the Madeira Organ Festival will therefore extend from the 15th century to the present day, each concert being dedicated to a different century. The young organist Catalina Vicens, who has established herself as one of the specialists in the performance of music from the 14th and 15th centuries, will perform repertoire including some of the oldest works for organ, making use not only of a reconstruction of an organetto – or portative organ – but also the historic organs of Ponta do Sol and the Convento do Bom Jesus in Funchal. The portability of the organetto allows the Madeira Organ Festival to travel for the first time to Porto Santo. In the 16th century there appeared the earliest Iberian source of organ music – the Arte novamente inventada pera aprender a tanger by Gonçalo de Baena, printed in Lisbon in 1540 – which the French organist Bruno Forst will perform on the beautiful historic organ of the Church of Machico, in the context of a programme dedicated to Iberian music contemporary with this publication. The 18th century, one of the most prolific periods in the history of music, is represented by the great Johann Sebastian Bach, to whom is dedicated the recital at the Colégio Church by the Dutch organist Matthias Havinga. The importance of the British presence in Madeira during the course of the 19th century is manifest in, amongst other things, the number of English organs still extant on the island today. The churches of Porto da Cruz and São Pedro no Funchal (which both have 19th-century organs) will bring to life again the repertoire for voice and organ used in the England of this period, with the soprano Cecília Rodrigues and the organist Sérgio Silva. The 20th century is a special period with regard to organ music, since, in addition to the output of organist-composers, there appeared a number of works by (non-organist) composers who became interested in the sound-world of the instrument. One of the most obvious cases is the Concerto for organ, strings and timpani by Francis Poulenc (written in 1938), which will be performed by the French organist Vincent Dubois and the Classical Orchestra of Madeira. Though frequently associated with the past, the organ continues to be an instrument of today. This connection between the past and the present with be marked by a programme of contemporary works for voices and organ based on Gregorian chant melodies, including the world première of Alma Redemptoris Mater by Fr Ignácio Rodrigues, the present choirmaster of the Cathedral of Funchal. The programme of the 9th Madeira Organ Festival will provide a panorama of six centuries of music, as well as a journey through the rich and varied organ heritage of Madeira, itself witness to the cultural transformations which took place during the course of the archipelago’s history.